With a new outlook, a new suit and a new (or should that perhaps be old?) 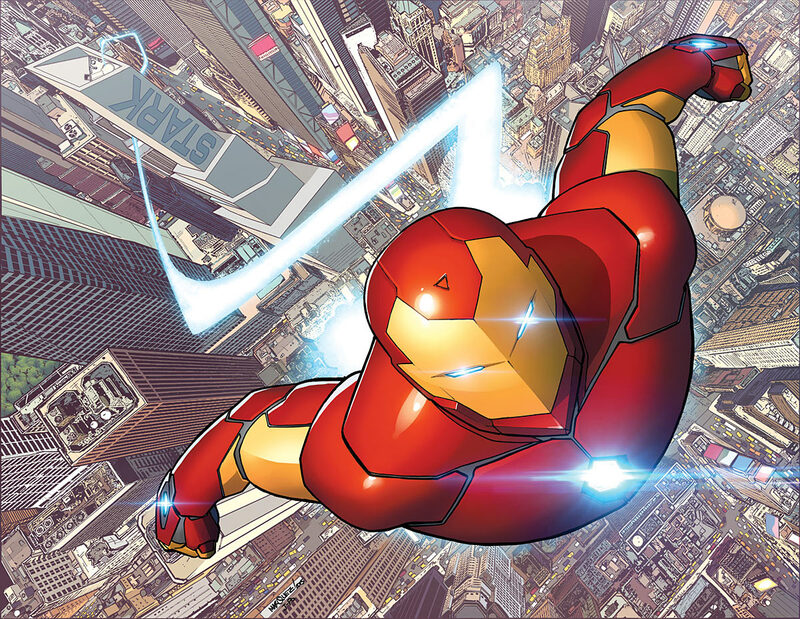 threat to overcome, Tony Stark is back with a bang courtesy of the new Invincible Iron Man series Marvel from Brian Michael Bendis and David Marquez. The story for this first volume revolves around the return of Madame Masque, who seems to be accumulating powerful cosmic artifacts for some reason, prompting Iron Man – as well as some of the Marvel Universe’s most power sorcerers – to step in and intervene. It’s an intriguing concept, and while it does hit a few snags along the way in terms of flow (and in establishing Masque’s actual motivations), the cameos along the way – including Victor Von Doom, Doctor Strange and Mary Jane Watson – make this first volume a brisk, enjoyable read. That said, I’ll admit that I’m on the fence somewhat regarding the artwork, provided here by David Marquez. On the one hand, his pages are slick and the panels flow smoothly, plus there’s absolutely no denying that he draws a mean Iron Man suit. Marquez also really excels during the action sequences, charging his panels with a sense of energy and dynamism that really pops off the page. On the other hand, there’s a worrying sterility to some of the ‘talky’ scenes, with the characters occasionally looking more like waxwork figures than actual people. Also, the chunky, thick-lined inking made it occasionally feel like I was reading a comic book based on FX show “Archer” rather than one of the Marvel Universe’s most iconic heroes (particularly when the pink, “holographic” A.I. Friday shows up). In spite of its obvious strengths then, the inconsistency of tone really prevents this first volume of The Invincible Iron Man from becoming something truly special. When it embraces the lighter side of the character, such as his back-and-forth banter with Friday and the absolutely hilarious exchanges with Doctor Strange, the book truly shines. Unfortunately though, when it tries to tackle the more serious aspects of superherois it falls more than a little flat, with some jarring emotional beats that work well on their own, but feel unwieldy when set alongside the otherwise light-hearted tone. Overall then, if you’re a hard-core fan of Iron Man, this volume definitely comes highly recommended. The blend of humour and large-scale action works well to accentuate the finer points of the character, and Bendis packs in some absolute zingers to the dialogue. For casual readers however, this may be a tougher sell, with an uneven tone, a fairly bland plot and some occasionally awkward artwork distracting from the top quality banter. This is a classic case of “good but not great”, although the way this first volume comes to a close sets up things nicely for the series to come, leaving me quietly optimistic that Bendis and Marquez can turn this latest Iron Man offering into something truly invincible. You can purchase Invincible Iron Man vol. 1: Reboot TP from Turnaround Publisher Services (who generously provided the review copy of this title) via their official website.